You know how we're an art family...: Welcome, Spring! We decided to have a minor celebration this morning since the big kids will be with their other parents this evening. 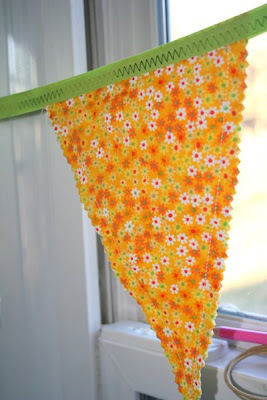 I worked until late last night on this spring banner, my first. 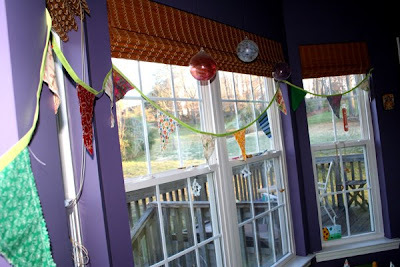 There are a few changes I think I'll make with my next banner, but the kids thought it was wonderful. We also had spring smoothies for breakfast this morning. With 8 strawberries, 1 banana, 1 cup frozen pineapple, 1 cup of orange juice, and a scoop of Amazing Grass greens, they were a spring breakfast hit. Smoothies are Finn's favorite food so I had to include a picture of his thrilled face. 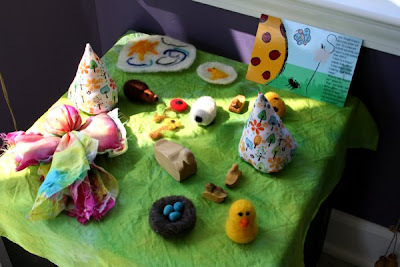 Our nature table also received a small addition of robin eggs in a felted nest from Natural Kids and Toys on etsy. The kids also added a few dandelions, but as dandelions do, they wilted just a few hours later. I hope everyone else is enjoying the beginning of spring as much as we are! PS. Our temperatures dipped back down last night and Elizabeth observed this morning, crossly, "I thought spring was supposed to be WARM. Maybe spring should start another day." I so agree with Elizabeth. 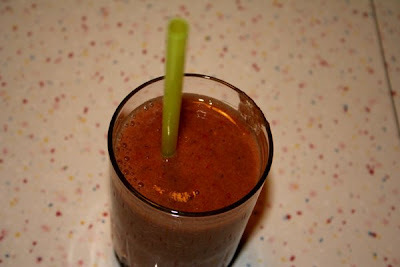 And I like the recipe for smoothies-- we usually start ours with yougert, but I think that fruit blend sounds wonderful. 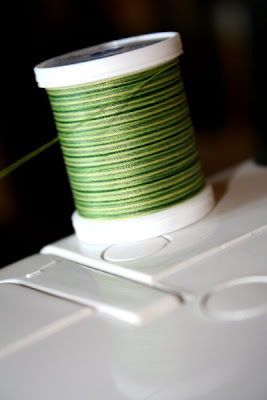 I am giggling over the color names of the bias tape, and I too didn't know variegated thread existed on the spool! Your banner sure did turn out pretty with all the boys brought home. I think the banner turned out lovely! Finn's face cracked me up - he loves his smoothies! Cute banner! I'm interested in trying the Amazing Grass greens you mentioned in our smoothies...looks like a good way to pack 'em with vitamins. I have to admit that I agree with Elizabeth. I was rather perturbed this morning when it was still so cold. The first day of spring should be wonderfully warm and sunny. There should be a rule about that somewhere. I love that you celebrated spring! It's been one of those winters where I think all parts of the country are looking forward to warmer weather and sunshine. Happy Spring! You are a very good mommy! What a wonderful day! Sounds like a great Spring celebration! Your banner is lovely, just like your nature table. I am now determined to find a place for a nature table! Have a great day! 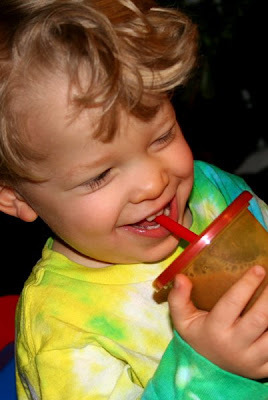 We love smoothies - we are actually drinking some now (peach/banana/blueberry/yogurt/greens). The banner is great - and love that thread!